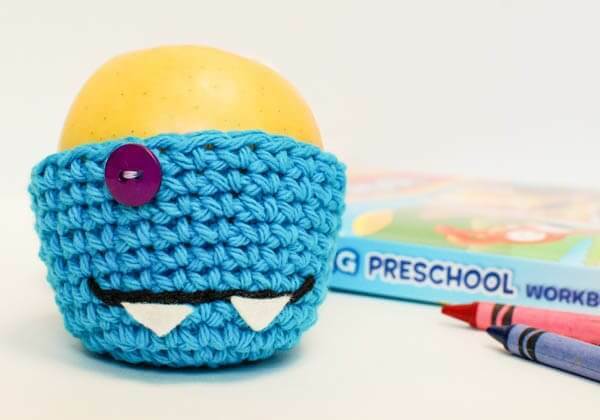 Yes, another apple cozy! Now each child has his and her own cozy, and I am hopefully done making them for a little while at least. This time I switched up the crochet monster cozy a little bit. If you missed any of the other cozies, you can find the links to each at the bottom of this post. 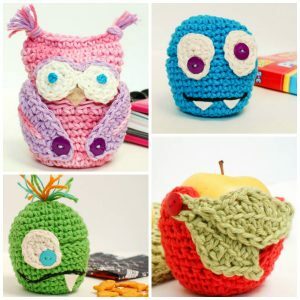 Follow the pattern from the original monster cozy here for the top, bottom, and eye. With white, make a magic ring (as an alternative to the magic ring, you can ch 4 and join with a slip stitch in furthest chain from hook to form a ring). Round 1: Ch 1 (does not count as st here and throughout), work 6 sc in same ring, join — 6 sts. Round 2: Ch 1, work 2 sc in same st as join and in each of the next 3 sts, 2 dc in next st, 2 hdc in next st, join — 12 sts. Fasten off, leaving a tail of approx. 10 in. Sew one button to eye. Using a tapestry needle and the long tails, sew top and bottom together along 6 sts only forming a hinge on which the top will open (this will be the back of your cozy). Sew the eyes to the front of the top piece, ensuring that the button loop eye can reach a little over the bottom piece as shown above. Find button placement on your bottom piece in relation to your button loop and sew button into place. Weave in ends. Using a D hook and black crochet thread, work a surface stitch on the bottom piece to create a mouth. 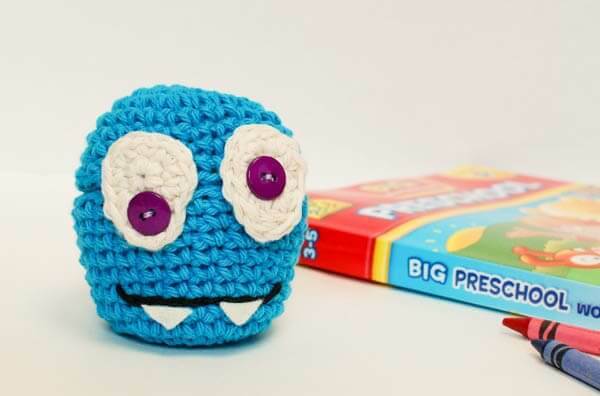 Add small felt triangles for a teeth or you can embroider them instead if you prefer. Check out all the cozy patterns.